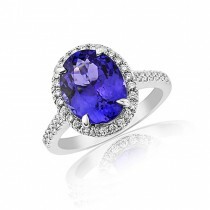 The best sapphires are reputed to be those with a deep velvety blue hue, evenly distributed throughout the stone, combined with a bright, clear interior and external lustre. This fabulous four and a half carat Sri Lankan sapphire has all of that in abundance. In order to show it off to best effect we have mounted it in platinum in a modern four claw style with two round diamonds weighing half a carat each - both certified as superb G colour and VS2 clarity. Despite its large size (approximately 11 x 8 mm), the claws on this truly amazing sapphire curl underneath so it can be worn alongside a straight band as an engagement ring or as a stunning contemporary dress ring.